When you refer a friend and they add cash in their Rummyculture account, you earn same bonus as them, up to Rs.1000. Log in to your RummyCulture account from your mobile or computer, and copy your unique referral link. Share this unique link with your friends. Please ensure that they create their RummyCulture account using this link. Friends who have registered through your invite link will be counted as your referral. You can earn UNLIMITED bonus through your referrals. 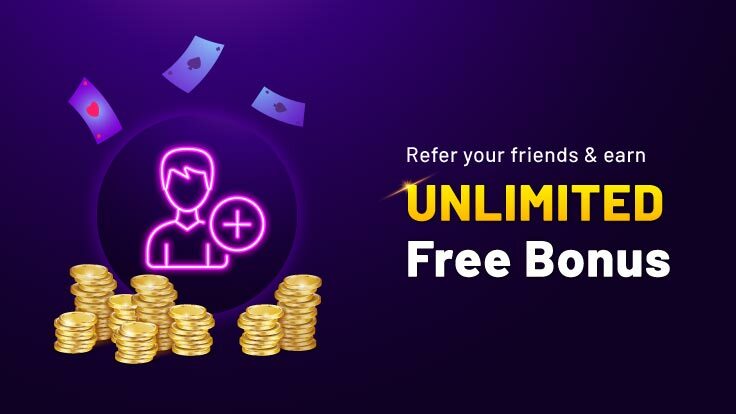 You will earn referral bonus from your friends for lifetime. There is No Time Limit on their add cash date. You will get 20% of your friends add cash amount as bonus every time they add cash. You can earn upto Rs 2000 referral bonus from one referral friend. This offers is valid for all Rummyculture users ( new and cash user ). Mobile devices which have previously been used to create RummyCulture accounts will not qualify for the referral money. Only one account per mobile device is allowed. If more than one accounts have been created through one device, only the account created first will get the referral. Only eligible friends will be considered for determining to refer & earn program. You confirm that the friends you refer are known to you and do not restrict promotional communication from you in any manner whatsoever. You confirm that you shall not create multiple email addresses and refer the same from your user account & all referrals will be complete system driven any unsolicited requests will not be entertained.